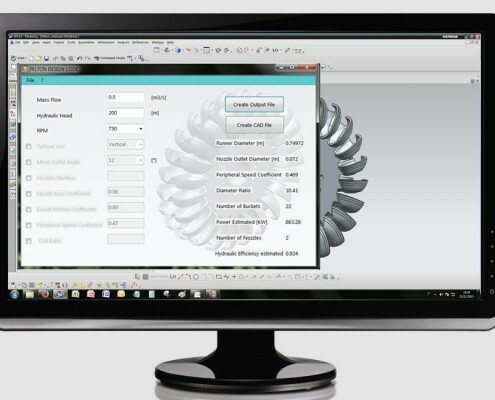 A versatile and powerfull software to design hydro Pelton wheels from design basic parameters up to final CAD drawings for CAM machine tools, thanks to the interface with Siemens NX CAD software. Pelton wheel is a water impulse turbine used with relatively high hydraulic head at low flow rates, conditions which give hydraulic efficiency around 90%. The software, starting from the state of the art of technical rules, allows to design advanced Pelton turbines, optimizing number of blades and nozzles, peripheral speed coefficient, runner diameter and diameter ratio thanks to an intuitive interface. Definition by expert users of additional input parameters makes the software versatile and reliable. The software calculates the main geometric parameters and automatically provides data to NX CAD software, to create the 3D CAD model for the CAD process.